More than 1,000 people are dying on the Thai roads every month. Daily News reported that stats from yesterday when 29 were killed brought the grand total since January 1st to 6,831 dead. However, the news media cautions that this figure is set to rise when all results are in from some precincts that wait until Tuesday to report the weekend death toll. And these figures only represent the death toll from victims who die at the scene of accidents. They do not count the people who die in hospital or as a result of their injuries so the real figure is much higher. Thaivisa notes that on average this reporting anomoly suggests that the actual death toll is around 70% more than the figures suggest. Daily News keeps a daily check on the carnage in an ongoing campaign. They commented on the latest bus accident on Kata Hill in Phuket when a Chinese tour bus collided with a pick up and ended off the road. Fortunately no tourists were seriously injured. They also showed a short video of a Tuk-Tuk side swiping a car and a person being thrown to the tarmac. It was not reported what happened to the victim in that accident. So far an average of 38 people have been killed per day in June. 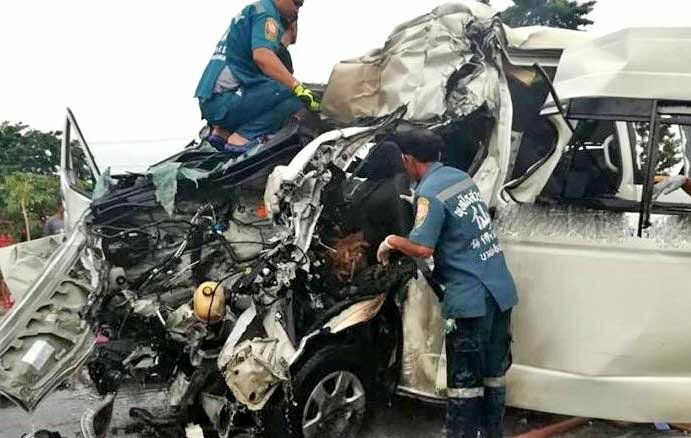 If the figure of 70% more deaths away from the scene of accidents is taken as a benchmark for the true likelihood of the number of fatalities then it would mean that around 25,000 - 26,000 people in total will die this year on the Thai roads. Many people accept that the Thai roads are the most dangerous on earth. Save that headline for next year, and the year after. Looks like their number two position is safe for now. Might even get a shot at the title during the FIFA world cup drinking binge. And yet the cops are instructed to go after and haul in people who (rightly) criticise the government's lies, ineptitude and abuses of power. They never will get out on the roads and especially not the expressway. It's to bloody dangerous. The emergency stopping lane is a joke so there is no safe place to get out of the car for them to book a speeding driver. The police a smart enough to a least save their own lives. Hence cameras have got to be the best solution along with greater enforcement. Thailand has been number one for a while now, passed Libya, previously number one . Meanwhile, the Thai police are travelling to Europe looking for good shops Facebook posters. Speaks volumes about this rancid government. If 30 or 40 people were being knifed or shot to death every day, there would be massive outcry and action to try to stop it. But the roads? It is as if the authorities and the public simply don't care in the slightest. These numbers are rectifiable, but not with the current approach of zero traffic law enforcement. Well, they can't be crap at everything. Sure they can, they've proved that time and time again. Some educators have claimed that to be truly expert at anything requires 10,000 hours of practice. Have Thais had 10,000 hours of being useless? Sure they have. So why the disbelief? It's already an unconscious skill, they don't have to think about it any more, being crap at everything is their automatic action. Am I Thai-bashing? no. Am I racist? no. What I am doing is being unafraid to tell it like you already know it is. innocent people die cops pocket bigtime..
it would mean that around 25,000 - 26,000 people in total will die this year on the Thai roads. An achievement the PM would be proud of. We are moving to Chiang Mai soon and this is a MAJOR concern for us. I came across another fatal accident in Thonglor at lunchtime today, it was about 50 meters away from where I saw an old lady get taken out by a lorry who ran a red light at speed some months ago, what shook me was the fact that traffic drove round her body on the road whilst the motorcycle taxi guys were helping the rescue guys. I didn't see today's accident, I don't know if it was a motorcyclist or pedestrian, or whatever, in fact I'm assuming it was an accident. When I approached the incident the rescue guys were carrying a body into an ambulance whilst another was scraping blood and matter off the road, whilst the traffic was trying go find their way round them, that's a job I couldn't do. As soon as the body was removed and the road cleaned the traffic carried on as normal. Not sure that I would have expected anything else but it seemed so low key and matter of fact and indicative of local people's attitude to road deaths.